Please join us for the 18th Annual Derby Day Celebration hosted by Gateway Industries, Inc. 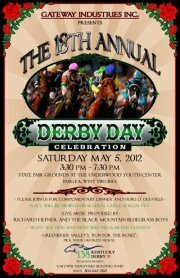 The event will be held on Saturday, May 5, 2012 from 3:30pm – 7:30pm at the Underwood Youth Center at the West Virginia State Fairgrounds. Every year an average of 350 participants and several local businesses support our efforts to help Gateway fulfill its mission to provide employment and rehabilitative services for persons with disabilities in the Greenbrier Valley. Event Tickets, Sponsorships and Program Ads are still available , please contact phyllis@gatewayind.com or becky@gatewayind.com or call 304-645-3165 for more information.